woohoo yeahhh KILLA ALOT OF DUST GONA BE!!!! hello greek psy lovers, again a fine chosen line up for those who wanna dance hard all the night. Good luck Sophia for this good party again!!!! Impatient to meet you in one of these great party. Tschussssssssssssss Most Important in life, love, be cool, good feelings and have fun. Hope that for anyone. "Good feelings bring good feelings"
all the best...b00m! "pigs on the wing"
all the best for all and my friend Sofia!! I 'd like to announce that Kerosene club can't take visa in time unfortunatelly so we make a change! Ajja is one of the managers of Peak Records and has been involved with music all his life. As one half of Yabyum & founding member of The Peaking Goddess Collective, he has released many tracks on Peak & other labels. Ajja has also self-produced many albums in more conventional styles, including his chill album &#8220;Chillsome&#8221;, much appreciated by trance lovers & melodic chill fans worldwide. His solo live act evolved as a natural center point to his other projects. Fusing his twisted psy-experience with his love of funky grooves, he has been delighting trancefloors with his Ajja sets since 2004. 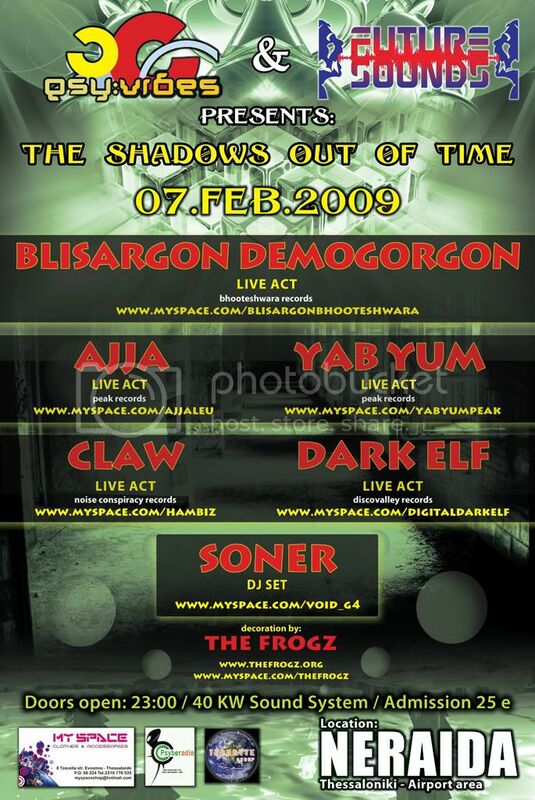 Yab-Yum is the live electronic psychedelic trance project of Ajja... Until recently he was joined by Dj Gaspard & played all over the globe at major festivals & small parties alike. Since Gaspard retired from the music scene in 2008, Ajja has continued to write & perform under the name Yab-Yum by himself... as well as continuing to perform as Ajja & as part of The Peaking Goddess Collective. excelent line up once more. bravo to the crew! Ajja and Yab-Yum both is a super double killer psychedelic set artist!!! it ll be Great for sure!!! i hope be there!! Hey...Looks like a very good party. Wishes to a great one to sophia and all involved. interesting lineup specially ajja... see you all there. b00m!! !